AirPower detergent is a water soluble alkaline detergent which dissolves and decomposes both animal and vegetable fats and oils and remains of industrial fats and oils, such as heavy fuel oil, machine grease, oils and oily pitch. 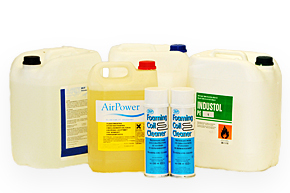 AirPower detergent can be purchased in 1L and 5L canisters. Grease ducts and air ducts.